The Cardinals cut Simmons from their practice squad Monday, Darren Urban of the Cardinals' official site reports. Analysis: Simmons was replaced by Brandon Wilds. Simmons has yet to suit up for a game through three NFL seasons. The Cardinals signed Simmons to their practice squad Wednesday, Kyle Odegard of the Cardinals' official site reports. Analysis: Simmons spent the preseason with the Giants, but was unable to crack New York's 53-man roster. The 26-year-old tailback will attempt to make more of a splash on Arizona's practice squad and work to earn a special teams or depth role. Simmons was waived by the Giants on Saturday, Ralph Vacchiano of SportsNet New York reports. Analysis: Simmons had one last opportunity to prove his worth in Thursday's preseason finale against the Patriots, and while he did rush 11 times for 41 yards, it looks like it was too little too late for the tailback. He may be a candidate to return as a member of the Giants' practice squad. Simmons rushed 11 times for 41 yards during Thursday's preseason finale against the Patriots. He also secured one of two targets for two yards receiving. Analysis: It was good to see Simmons running around after missing last week's preseason game with a concussion. 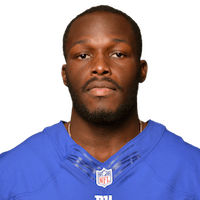 However, the running back is firmly on the roster bubble and he may not have been impressive enough to make a serious case for the Giants to keep four running backs at final cuts. Simmons left Friday's game against the Lions with a concussion, Tom Rock of Newsday reports. Analysis: Simmons is seeking a depth roster spot with with the Giants, but his performance before his injury was won't help his chances. The 26-year-old rushed six times for 11 yards, while three other Giants running backs scored Friday -- Robert Martin, Wayne Gallman and Kyle Lauletta. There are no videos available for Jalen Simmons. Click here to view all videos.